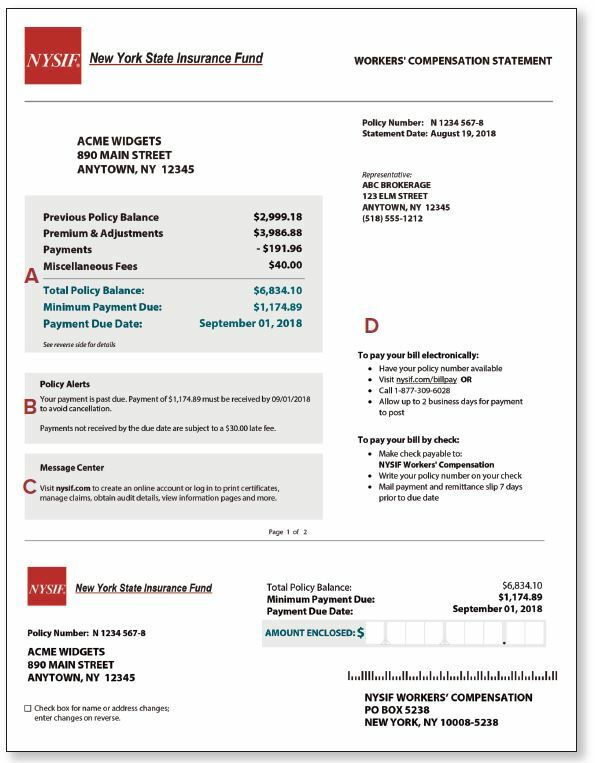 A This box displays a billing summary for the current billing period. 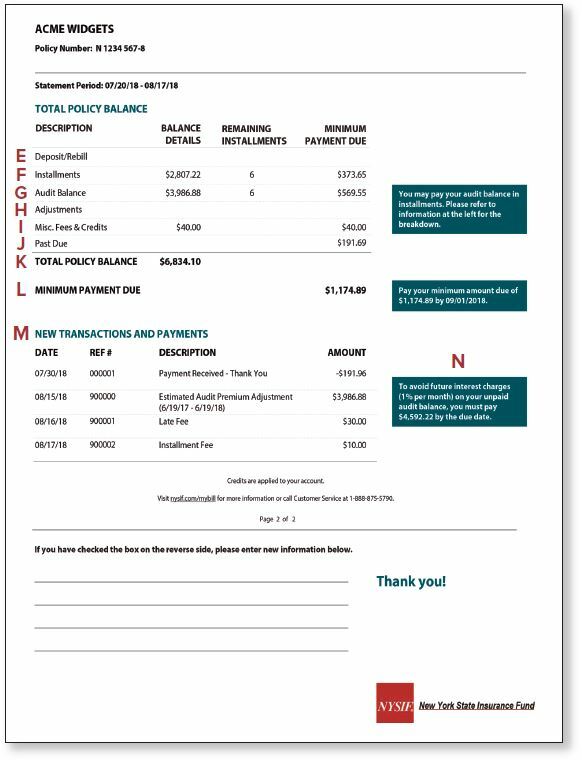 Your Total Policy Balance reflects the balance from your last bill and payments, adjustments and fees that occurred during the current billing cycle. Itemized transactions for the current period can be found on the reverse side of your bill under New Transactions and Payments . You must pay the by the date shown to avoid a late fee. B Policy Alerts provide important information affecting your policy. C The Message Center offers details on NYSIF services and latest news. D NYSIF offers you several Payment. Options. Go to nysif.com/billpay to pay online by electronic funds transfer, credit or debit card, or by phone. You can also pay by check using the remittance slip (right). E Deposit/Rebill is the premium deposit required based on initial information in your application. A rebill reflects any premium deposit adjustment based on new information. This amount must be paid in full. F Installments (for policies with payment plans) show remaining installments and current installment due. There is a $10 installment fee per installment, which is reflected in the Miscellaneous (Misc.) Fees & Credits total. G An Audit Balance or credit may result from a premium audit. Audit balances of more than $1,000 may be paid in installments. Unpaid audit balances are charged monthly interest of 1%. Interest charges are included in Miscellaneous (Misc.) Fees & Credits. H Adjustments reflect changes made to your total policy balance. Adjustments are itemized under New Transactions and Payments . This amount must be paid in full. I Miscellaneous (Misc.) Fees & Credits reflect the sum of installment fees, interest, late payment fees and other charges and credits. J Past Due amounts reflect unpaid charges from your previous bill including prior installments. K Total Policy Balance reflects the remaining premium balance, including remaining installments. L Minimum Payment Due is the sum of items (E) through (J). This amount must be paid by the due date to avoid late fees and/or nonpayment cancellation. M New Transactions and Payments show all activity for the dates listed. N This amount is the sum of your current installment, your full audit balance, any miscellaneous fees or adjustments that are immediately due and any amount past due.